If you’re interested in building green but don’t want to spend a small Turkish fortune to get a sustainable home, then you might be interested in learning more about cob houses. Why? Well, because cob homes are durable, green, and dirt cheap (no pun intended!). Cob is a mixture of straw, sand, and clay. It’s similar to adobe, but the only difference is that cob uses a higher percentage of straw. According to GreenHomeBuilding.com, cob is usually mixed together with your feet (or, hundreds of years ago, by having it trampled by horses). It’s applied to the home-in-progress in large globs (rather than pre-formed bricks). People have been building homes with cob almost as long as they’ve been farming. So, cob homes have been around for thousands of years. 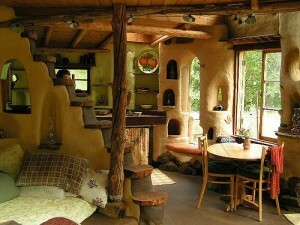 Even in the 21st century, cob homes can still be found all over the world. The reason why cob never really took off in the United States is because here, we’re blessed with abundant trees. When the first tired pilgrims landed at Plymouth Rock they needed homes, and they needed them fast. The pilgrims didn’t really take with the idea of trying to manipulate mud in the raging snowstorms of the Northeast. So, stick-built construction took precedence over cob construction. 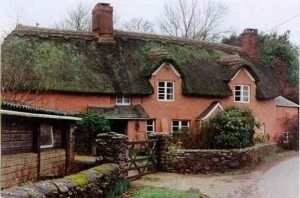 In England, however, cob was extremely popular, especially during the 18th and 19th century. And, many of these ancient homes are still going strong today. Wait…Won’t Cob Melt When It Rains? Cob is incredibly durable once it dries. See the first picture? 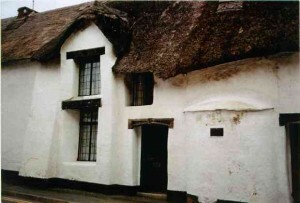 That cob house is located in Cornwall, England, and was built in 1539. As long as you put a cob house on a solid foundation, and give it a good roof, there is no reason why it won’t last hundreds of years. So, Why Build A Cob House? There are several advantages to building a cob house. Cob is sustainable. You’re building with natural resources: sand, clay, straw. When its life is through, your cob house can go right back to the earth, where it came from. Cob is healthy. Because you’re using 100% natural materials, there is no danger of “off gassing” from things like fiberglass, sheetrock, paint, cabinets, etc. You’ve got a healthy home right from the get-go. Cob is energy efficient. Cob walls are usually 1-2 feet thick. Because of this, cob homes stay cool in the summer and warm in the winter. Most cob homes only use a small stove to stay warm. Cob is fun. It’s like being a kid again, at least I’d imagine it to be! Imagine playing with mud all day, sculpting the house just how you want it. Want a curve here? Need a shelf there? You can make them according to your whim. Most cob homes are nothing alike. Cob is cheap. If you can use the soil right at your building site, that is. If it has to be trucked in, the costs will go up significantly. I’ll go into this a bit more in the next section. Ok, so I said above that cob is cheap. And, it is. But a cob house is only cheap if you do a lot of the work yourself. If you hire a cob builder, then you’re going to pay just as much for your cob house as you would a traditional stick-built home. Because building a cob house is very labor intensive. You’re going to pay a pretty penny if others do the grunt work. The good news is that it’s fairly easy to learn how to build with cob. GreenHomeBuilding.com interviewed Michael Smith, the founder of the Cob Cottage Company and author of several books on cob construction. He says that the best way to get a cob house is to take a workshop from a professional, and then just do it yourself. Especially if you have time on your hands, this is the best way to go. You can visit CobWorkshops.org to see a list of all the upcoming events around the country. There had to be some, right? Resell– If you want to move, you might have a hard time finding a buyer for your cob home. After all, this is the day and age of the McMansion. Most people want the vinyl siding and white picket fence. So, your market is going to be limited. Financing- Cob houses cost very little to make, so hopefully you won’t need to ask for a loan. If you do, however, you might run into some trouble. After all, banks don’t usually hear “Yep, I want to build a home out of mud and straw.” They’ll be reaching for that red “DENIED” stamp before that sentence even gets out of your mouth. Building codes- You might run into a web of red tape when it comes to your local building comes. Some states are more lax than others, but it’s important to fully look into your local requirements before you start construction. This will save you headaches later on. 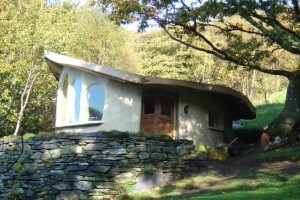 Because cob houses are sculpted by hand, there is incredible freedom when it comes to design. That’s what makes them so much fun! 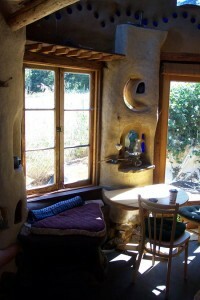 Cob homes are organic, flowing, and incredibly artistic (if you want them to be!). As you can see in the picture on the right, you can create unique arches and niches wherever the mood strikes you. 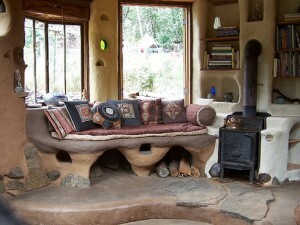 Meka’s Cob Cottage has to be one of the most beautiful homes I’ve ever seen. He built it himself in Wolf Creek, OR, over a period of four years. You can see many more pictures of Meka’s beautiful home over at Green Building Elements. If you want to learn more about building with cob, then check out some of these great resources. Thanks for the link to my site and spreading the word about cob! So, what would a person do if she doesn’t have a lot of- or any- clay on-site? Hey out there, I am interested in cob/adobe building and want to learn more! new chapter in my life! Thanks for the information on cob building. I am planning to build in southwestern Utah over the next couple years. I often find the ancient Pueblo Indian homes made from cobbed mud and sticks in the walls of the canyons near my land. They first inspired me to look into ways to build my own earthen home. I would also like to incorperate Juniper,Cedar, Pinion and Ponderosa limbs and wood into the house and making furnishings of which there is plenty around me. I am thinking of putting a raised (3 ft above ground) one room addition on my ranch home in Pittsburgh, Pa. It will connect into a brick house and be 9 ft. x 12 ft. dining room. I thought of sinking two piers into ground and connecting to just above cinder block (resting on it – is outer wall of existing house) and putting steel I beams across. CAN I BUILD COB WALLS ON TOP OF THE I BEAMS SO THE 3 COB WALLS WOULD BE SUPPORTED BY THE 2 CORNER PIERS AND I BEAMS OR ARE THEY TOO HEAVY FOR THAT AND SHOULD BE BUILT FROM GROUND UP? sorry for the late response Isreal, I would suggest against that idea simply because of the tremendous weight of cob, a cob walls needs to be firmly set upon a solid stem wall with its weigh evenly distributed to the ground!! you could do a different application called light straw clay, where a conventional wall is framed, the plywood is screwed to the the wall from base up to 4 foot, then filled with loose straw that has been bathed in a clay slurry then packed into the wall from above, once dried the plywood is removed and the next section done, until all of the walls are filled and dry, then a earthen plaster is applied to the interior and exterior, very beautiful finish!! If we are returning to use the clay (mud) to build a house for a people we can solve the problem of the world . I love the photos of your beautiful home. There are a few earth homes in New Zealand and generally, in my opinion, are the most creative living spaces available to average people. Well, people involbved in building earth homes appear to be a lot more creative than average which makes them fun to know. I bet you are no exception. well done!!! i love cob….i love clay…i love earth and thank God we’ve got plenty of it nigeria just dat alot of people no longer regonize the beauty of nature and it hurts……. I’m considering building a home in the Asheville, NC suburbs and would love a cob home, but am a single middle aged woman without a lot of building skills. I’m able to work with someone, but would need someone to pull it all together. How can I go about finding such a person or group?